Summary: A passive mechanism moves the tower forward at the start of the match to gain additional height. A wrist, arm pivot, and claw facilitate the placing of innertubes. Frame: Welded aluminum square tubing. Drivetrain: Three wheels on each side controlled tank-style. The middle wheels are offset. Powered by four Large CIMS. 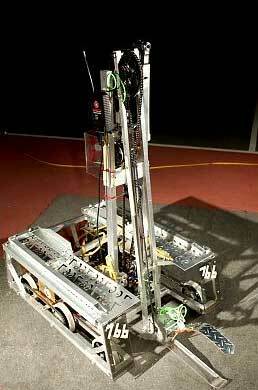 A pneumatic-powered two-speed shifter allows the robot to be in a high torque, 6mph mode or a high speed 20mph mode. High turn rate. Game motors: A large CIM at the base of the tower powers the arm, a smaller motor on the top of the tower powers the wrist. Four pneumatic cylinders power the claw. 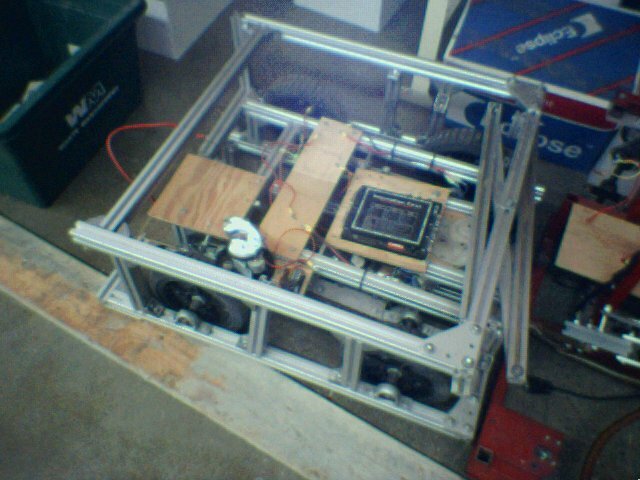 This robot has undergone 3 major stages in its development. 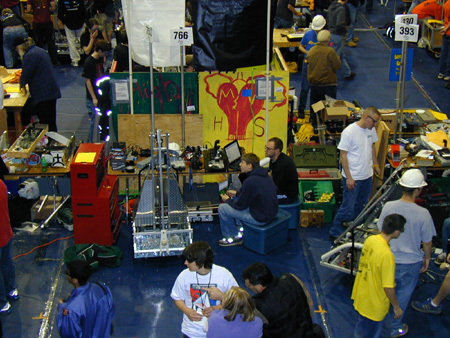 Summary: Conveyor belt at opening in the front of the robot grabs carries balls to a central hopper, where they may be dropped into the shooter via a "tongue" or dropped into the bottom goal by reversing the belt. The hopper is open netting, allowing balls to be thrown in. Fiberglass poles are used to guide balls into the shooter. Drivetrain: Three wheels on each side controlled tank-style. The middle wheels are offset. Powered by four Large CIMS ~ 9Mph, high turn rate. Game motors: Two Large Cims power the two shooting wheels, a small electric motor moves the belt. A "tongue" is used to allow balls into the shooter by acting as a floodgate. An agitator in the hopper keeps balls from being jammed. The shooter, located in the middle of the robot, was easily blocked and inaccurate. The tongue and agitator were ineffective at controlling balls and they would often become stuck. However, the Robot's powerful drivetrain, good manuvering and solid frame made it effective at defence. Summary: The Same as the initial design, but with a improved hopper less likely to jam and a faster belt. The shooter, agitator, and tongue were removed to accomidate the new hopper. The robot could only score on lower goals. Frame: Welded aluminum hollow square shafts. Much improved, but because it lacked a shooter it was left out of the running at Nationals. Summary: A massive overhaul effort to redeem the robot. Superior jam-free hopper and a new superstructure with a longer belt running to a unblockable shooter at the top of the robot. Game motors: Large CIM driving belt at high rate of speed, two small electric motors, geared for speed, driving shooter, large CIM controlling hopper input/output. Performed well at Cal games, all aspects of the robot work as expected. Summary: A design relying on experience from earlier mistakes. A simple arm holds and lifts and places game pieces. Sacramento: 1 motor driving long chain that drives arm at the top of the robot, geared for torque. Silicon Valley and beyond: 3 motors running in unison to drive the arm. Performed amazingly well, simple and powerful design was effective even on defense, and would routinely cap 6-7 goals a match. Summary: Used two large hoops to grasp game pieces. Once grasped the hoops could lift and place game pieces. Frame: Welded steel hollow square shafts used at the bottom. The upper structure is made of extruded aluminum bolted together. Drivetrain: Two rear wheels power robot tank-style. 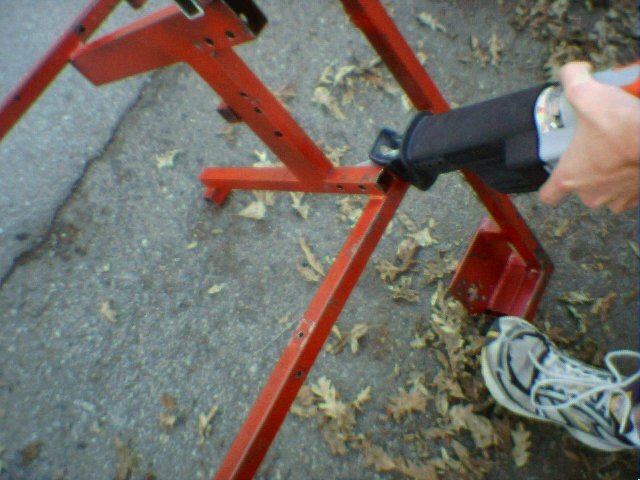 Front casters used for balance. 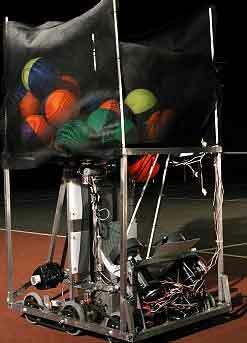 Game motors: Large CIM driving arm rotation, smaller motor controlling hoop's movement. Two small motors near the bottom power "ball herders," poles used to corral game pieces. 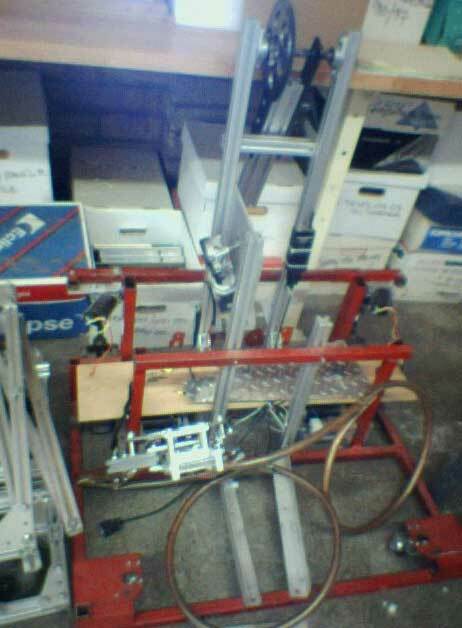 The strong steel frame proved too heavy, the casters made the robot weak in pushing matches, the motor moving the hoops was geared too slowly, and the extruded aluminum was troublesome. The hoops worked, but the lack if frame strength, drivetrain strength, and speed were disadvantageous. Summary: More advanced than the 2002 robot but still very similar. Used extending poles to knock over game pieces. Frame: Extruded aluminum bolted together. Drivetrain: 4 Heavy Duty Wheels powered by drill motors, not very manuverable. Game motors: 1 motor powering the extending poles. A simple robot which did not do exceptionally well. It was too short for the game and the lack of manuverability and weak frame hindered it. Drivetrain: Four Drill motors powering four large wheels.